Nightlife in the Philippines - Makati, Angeles City, Subic, and Boracay! No more boring and idle nights when in the Philippines! The nightlife scene in some key areas in the country has become louder and more entertaining. With lots of VIP clubs, discos, KTV bars, and gastropubs to choose from, you will never run out of a nightly dose of fun and pleasure, wherever you are! Known as the financial capital of the Philippines, this city is not only about skyscrapers, BPOs, and businesses because as the night comes, the happy hour begins. There is practically something for everyone in this city. 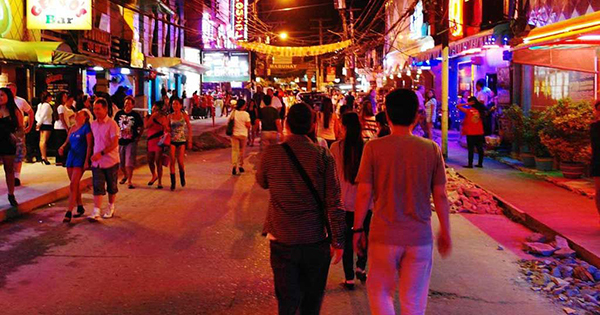 Burgos Street, one of the most popular nightlife areas in Manila has establishments that are open 24 hours. All-night entertainment is very much attainable! Greenbelt complex, a shopping mall in Makati, also offers different bars, nightclubs, and lounges. There is no dress code so wear your comfortable clothes and you're good to go! Raffles Hotel in Ayala Center, however, offers a high-end bar experience in the world famous Long Bar. There is a smart casual dress code in this bar though, so you'll have to leave your slippers and t-shirts elsewhere. Considered as the number one entertainment capital of the Philippines, this city became popular mostly because of the numerous girly bars in the area. But over the years, the nightlife scene there has seen some development as new establishments that offer more sophisticated ambiance also emerged. Among the most popular nightlife spots are High Society, a high-end club, KM 91, a live band resto-bar, and Secret Garden, a KTV bar. Not too far away from Angeles City is another entertainment hub known for its girly bars, Subic. Also blessed with beautiful sandy beaches and other natural attractions, this town around 4 hours from Manila and 2 hours from Clark is a popular tourist destination most especially for expats. As the sun goes down and the night goes deeper, tourists then enjoy hanging out at the bars around the area. For some, Boracay basically means partying at the beach. After watching the mesmerizing sunset, tourists stroll and flock to different bars and clubs on the island to have more fun. White Beach in Boracay is divided into three stations, with Station 2 having the most active nightlife scene. Station 1 and Station 3 also has its own share of nightlife experience with the former having a more luxurious touch and the latter with a more laidback feel.